Auroville's relationship with the neighboring Tamil villages has always been recognized as an important aspect of the city's growth and development. 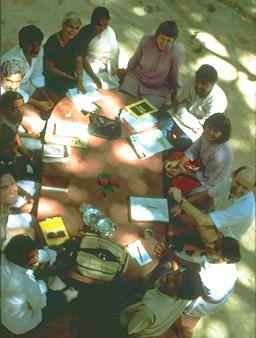 One of the very first institutions established in Auroville was the Health Center in Aspiration. The center has a small maternity wing and provides allopathic and homeopathic treatment, dental surgery, acupuncture, and massage. Services are freely available to local villagers. Two branches have been set up in other locations, and trained village workers are employed to visit the villages and provide aid and advice. In 1984 the Village Action Group was formed to further develop communication and integration with the villages. Aurovilians working with the local population have developed programs for family planning, health, sanitation, day and evening schools, and training and apprenticeship in crafts. There are six centers in Auroville working with the villages. Isai Ambalam is a cooperative employing 300 villagers with a primary school for 100 village children. It is also the headquarters for the Village Action Group. New Creation is a training and production unit for pottery, weaving, carpentry, stone craft, and construction trades with a primary school for 125 children. Ilaignarkal is an after-work school for Auroville workers and a boarding facility for integrating village youth into Auroville. Arul Vari is an evening program in physical and general education for about 50 children. Vanakam is a small hostel for children. Arul Anandam is a primary school for 25 village children.